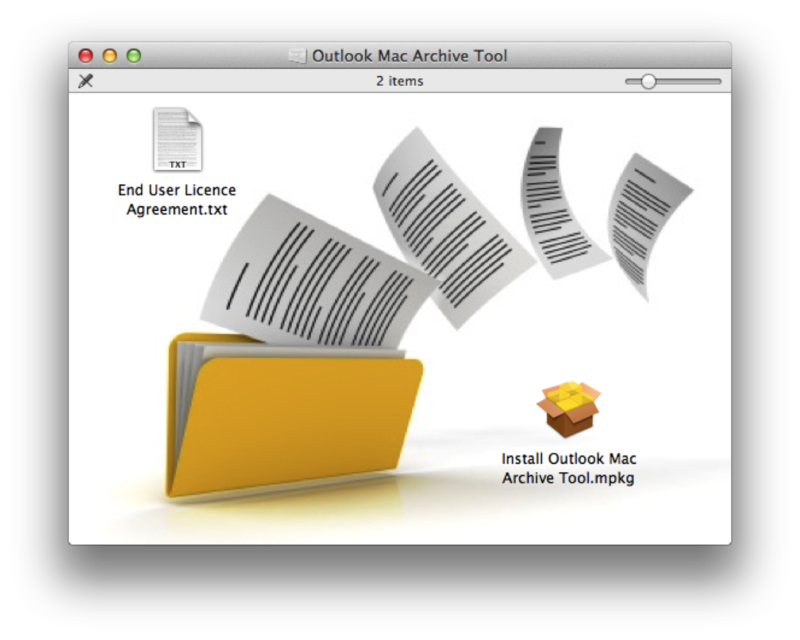 Out the box Microsoft Outlook for Mac 2011 has no equivalent tool to the auto archive functionality found in Outlook for Windows. First stop was to Google for an AppleScript that would do the job. Though I found an simple implementation for Mac Mail there was nothing I could find for Outlook Mac 2011 that matched the features of the Windows version. Commercial tools were poor at the time and after messing with Outlook Rules and finding them too weak I was inspired to create this script. – The script has a number of parameters which you can change if you are not happy with the default settings. 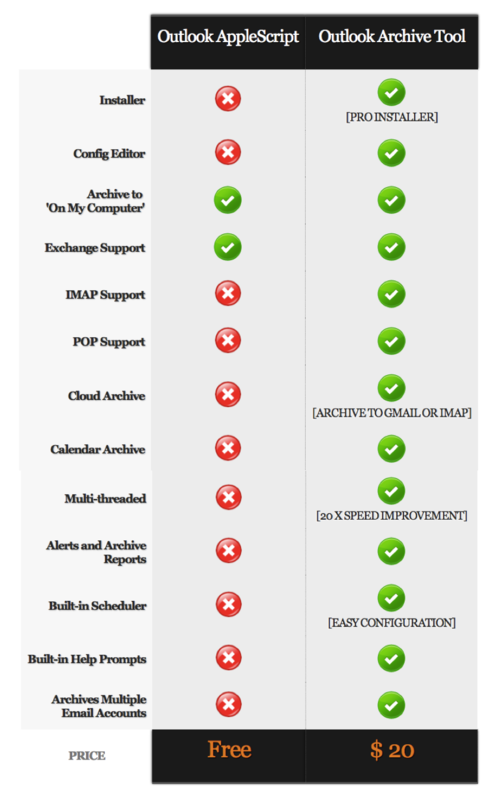 – Calendar and mail archiving can be configured separately, depending on your needs. – Fire and forget: … using the ‘Tools’ menu in Outlook and ‘Run Schedule’ you can run the script on a regular basis. 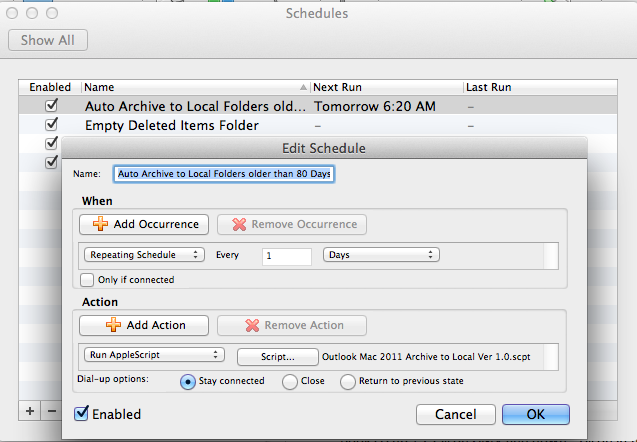 For example, configuring a schedule in Outlook as depicted below will run the archive script daily. – AppleScripts default timeout period that it waits for applications like Outlook to finish processing a task is quite short. The script now overrides this to 2 minutes by default but it can be made longer if you still experience timeouts (especially when you first run the script on a large mailbox and it has to process a long back log of archive items). – Added in a simulation mode setting which allows you to review the empty archive folder structure created on ‘On My Computer’ without moving all the mail and calendar items (can be run repeatedly without issue). If run in the AppleScript Editor the candidate mail/events that will be moved once simulation is turned off are logged to the events window. This allows you to test out various parameters to the script to see the effect before archiving any items. – Added in a new setting which allows you to archive sub-folders of excluded folders. Useful if you want exclude your inbox but still archive sub-folders of the inbox. By default this setting is not turned on and any excluded folder that is listed will also have it’s sub-folders ignored.